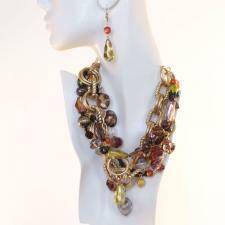 Milano necklace, OTF5-14, Hookster® by MS V Designs™, Five strand versatile fashion necklace. With the Hookster®, Experience the Value of Versatility, Exclusively from Ms V. Your Belt, Necklace, and Bracelet All In One!™ Variety of greens, golds, reds, orange, black, bronze beads. THE necklace for a real woman! A fine crafted necklace that makes you feel you took a trip to Italy.